Burning Man’s Rites of Passage theme this year got me pondering in a lyrical, booty beat sense. Late last night, when I couldn’t sleep due to a certain accelerating compression, I got up and nostalgically flipped through the various Rockstar Librarian Burning Man Music Guides of years past. The epic musical playa moments showered over me. First, I thumbed through the 2008 guide, and the page naturally folded open. “Root Society: Thursday, Fort Knox Five, Bassnectar.” My memory’s bass boom hit me, and I was back atop the metal spire, devouring the playa eye candy below. Then, I heard the familiar bass chord before I recognized the song. Upon recognition, I belted out one of my deepest belly laughs to date; tears of delight rolled down my cheeks. 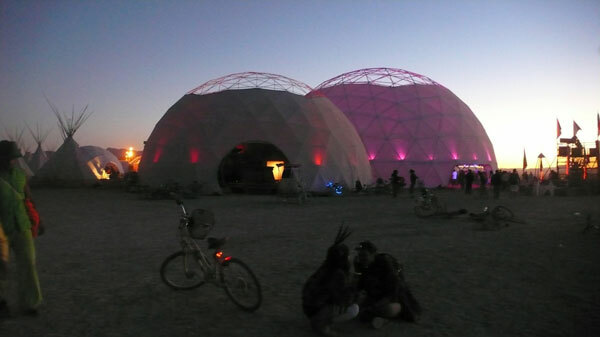 Here, among hot, furry bunny booties and chiseled, tribal gods, the dome filled with Dolly! Tell me! Were you there, too? Or should I immediately call and schedule an emergency appointment with my therapist? And then *FLASH* I was back, in my dimly lit bedroom, guide in hand. I set it on my bedside and cozied up for what turned into the happiest, dream-like sleep. Though I didn’t remember the details this morning, I’m certain I visioned booty shaking and bass beats. And now I can’t help but reminisce back on the music. So, join me throughout August as I share my completely subjective opinions (and I hope yours, too) coupled with intriguing musical facts, interviews, songs and sets to either take you back or catch you up on the musical rites of passage of electronica. ~36 minutes in will let you get your wits about you until Dolly kicks in…..
OMG! I sooooo love you. No, really… Must put this on my playa driving playlist *right now*!!! <3 <3 <3 I seriously LOVE FK5! They are one of my favorites as well. I noticed you reached out to them and got a conformation on attendance. Awesome!!! Here is a newer / shorter one to whet your whistle for how they may sound this year….. I caught Jon H on the playa this year…and it looks like FK5 will be heading to see us in New Orleans for VooDoo…..I’m pretty excited.